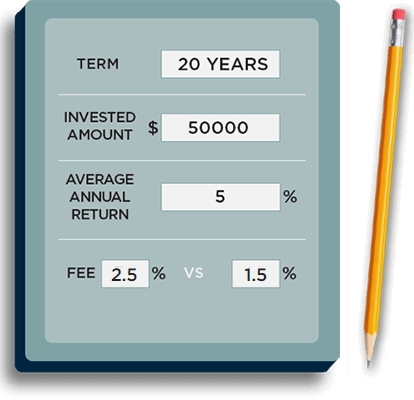 A 1% difference in fees on a $50,000 investment could mean an extra $17,500 over 20 years. Use the calculator to see how. Paying 1% more or less in fees won't make much difference to my returns over time. Not so. It’s important to know the true cost of the products you buy and services you receive. Paying a 2.5% fee rather than a 1.5% fee on your $50,000 investment could reduce total returns by more than $17,500 over 20 years, assuming a 5% annual return. Investment advisors provide their services for free. Investment advisors are paid by their clients directly, the firms they work for, or by the institutions whose investment products they sell. You can find out exactly what you paid your advisor’s firm last year—and what the firm received from others—from your annual investment fee report, also known as the Annual Charges and Compensation Report. Investment fees are set in stone. See what you should look out for in your annual fee report. Want to know what you are paying to invest? Read about the latest research on fees from the BCSC. Calculate return on investment with this tool.